There are 12 other images of this object. See our image rights statement. 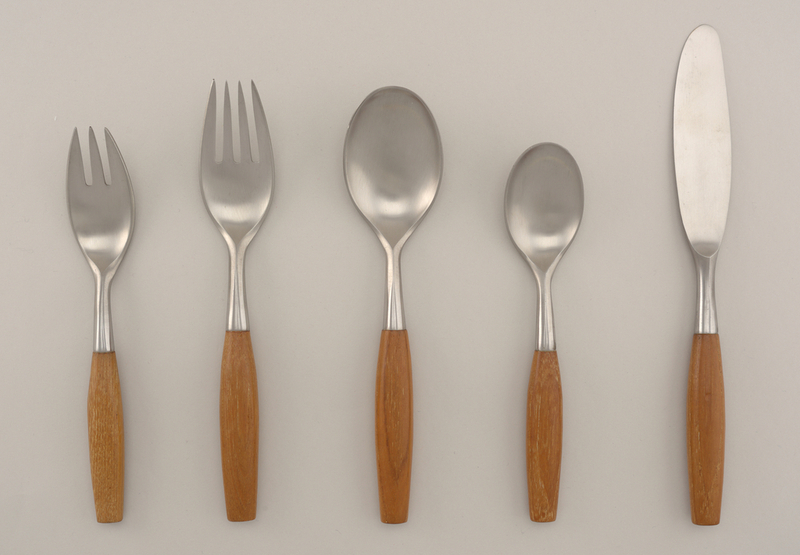 See more objects with the tag dining, curved, simple, eating, wood, handle, utensils. This is a Place setting. It was designed by Jens H. Quistgaard and manufactured by Dansk International Designs, Ltd.. It is dated designed 1954 and we acquired it in 1975. Its medium is wood, stainless steel. It is a part of the Product Design and Decorative Arts department. This object was donated by Dansk International Designs, Ltd.. It is credited Gift of Dansk Designs, Ltd..
On blade (a): a duck above three ducklings, above "DANSK DESIGNS GERMANY IHQ". On reverse of tines (b,d): "DANSK DESIGNS GERMANY IHQ". On reverse of bowl (c,e): "DANSK DESIGNS GERMANY IHQ".